Hi and thanks for landing here. It might seem a bit backward, but I decided to start blogging only because I've been enjoying Twitter so much. While I love the 140 character limit of tweets, I realised that a blog would give me a place where I could have the luxury of saying a bit more. I've also set up here because I have a blogging project in mind... but more on that later. Pastor Terry Jones of Florida finally got to burn the Qur’an on 20 March, months after he put the holy book on death row and despite appeals for clemency from Barack Obama. Bizarrely, Jones’s church, the Dove World Outreach Center in Gainesville, Florida, subjected the Qur’an to a show trial, and four forms of execution were considered: burning, drowning, firing squad or shredding. I don’t think shredding was available in medieval times (thanks be to God for that), but the popular practice of burning, always such a crowd-pleaser back then and a favourite of the church, won out in the end, and the Qur’an was soaked in kerosene and burned to a crisp. As a direct and easily forseeable consequence, protests were sparked in Afghanistan and five UN staff killed, allegedly by agents of the Taliban. Pastor Jones, clearly a man of limited imagination as well as charity, is reported to be unrepentant. 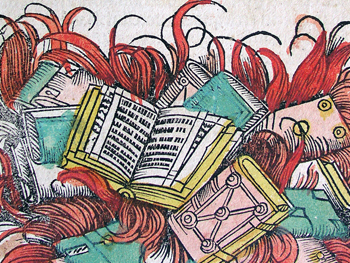 Writer and publisher Jon M Sweeney wrote an interesting piece in the Huffington Post in response, reflecting on the correct way to dispose of unwanted holy books. Copies of scripture which are worn out are honourably buried and shown the respect given to human beings when they die, he said. This is how old and ragged scrolls of the Torah are laid to rest, as well as ancient copies of the Qur’an. Jon Sweeney himself has buried Bibles with cracked leather covers and well worn pages in his back garden, and he imagines future owners of his house puzzling over what they find when they do some gardening. The respect normally given to the scriptures of almost all religious traditions highlights the incredible shock value of Pastor Jones’s Qur’an burning. When violence is done to a book which is normally treated with reverence and care, the impact is emotional. Jon Sweeney’s piece reminded me of something I’d read a long time ago about orthodox icons and what happens to them when their images fade beyond recognition. I actually have an old icon in that state, and I’ve been reluctant to simply throw it away. How are sacred objects treated at the end of their working lives? Leontius’s approach sounds very straightforward and robust. His description of ‘throwing the image into the fire’ does not sound like disposing of something ‘in a respectful manner’ to me. Possibly he is exaggerating in his eagerness to show that icons are not idols. Or maybe his bonfire of old and unwanted icons reflects a time when sacred objects were handled with more confidence and less fear. Either way, how we behave towards the precious and revered objects of our own faith and other faiths, and why we do it, deserves careful thought. In the weeks since I decided to start reading Islam’s holy book, I’ve been slow to make progress. It’s partly because the opening suras (chapters) are the longest and look more daunting than the smaller ones at the back – but at least I’m now deep into sura 2, which is entitled The Cow. One of the trivial things I like very much about the Qur’an is the chapter titles, which are short and inviting. Casting an eye down the contents page, I’m intrigued by The Spider, Smoke, Rolling Sands and Enfolded, all of them titles, and find myself looking forward to reading them. As for the believers, for the Jews, the Christians and the Sabeans who believe in God and the Last Day, and who do righteous deeds – these have their wages with their Lord. No fear shall fall upon them, not shall they grieve (sura 2:62). We revealed the Book to Moses, and We sent after him messengers in succession; and We granted Jesus son of Mary evident miracles and strengthened him with the Holy Spirit… (sura 2:87). But when Muhammad came – the passage continues – preaching a message which confirmed what the Jewish people had already received, they refused to accept it. Why? Because Muhammad was not one of them. To my eyes, these verses are full of hurt as well as anger – the hurt of unfair rejection. They remind me of the hurt and irony expressed in John’s Gospel about the coming of Jesus: ‘He came to that which was his own, but his own did not receive him’ (John 1:11). Because of the chronology, the New Testament has to talk about the Jewish people and how it sees them. And the Qur’an, which comes even later than the New Testament, has to talk about both the Jews and the Christians. As the youngest brother of the three faiths, it is very aware of them both: loving these older siblings for what it has received from them; hating them for where they have gone astray. It’s very much a family thing, in the Middle Eastern way. 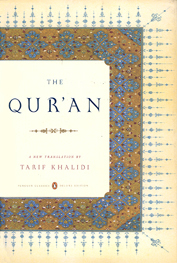 Quotes are from the 2008 translation of The Qur’an by Tarif Khalidi, published by Penguin. The language immediately reminds me of the Psalms and makes me wonder if the Bible would be different if it began, say, with Psalm 23. I think it would set a different emotional tone, and that’s the feeling I get reading these much-loved opening words in the Qur’an. Also impressive is this first glimpse of the qualities of God: ‘Lord of the Worlds’ sounds grand but distant, while mercy and compassion speak of love and presence. After these three lines, the Qur’an turns to address God directly as ‘Lord of the Day of Judgement’. The writer calls for God’s help in following the straight path, which is full of God’s generous grace, rather than joining the lost, who know only God’s anger. In Psalm 1, the poet contrasts two roads: the way of the righteous and the way of the wicked. Jesus refines the idea with his image of the broad way which leads to destruction and the narrow way which leads to life. But here in the Qur’an there seems to be just one road blessed by God; the alternative is to be lost in the desert, with no road to follow. The three monotheistic faiths envisage a right way and a wrong way. You are righteous or you are wicked. You follow God’s will or you are lost. You are welcomed with grace or driven out with anger. That uncompromising view is challenged now in western culture by the belief that there are many paths in life, and we have the freedom to choose between them without being judged. This sura raises the issue for me with new clarity. Ziauddin Sardar, who blogged the Qur’an in 2008, says that these opening lines are known as ‘the mother of the book’, in that they sum up the essence of the Qur’an, as well as being woven into the prayers which Muslims make five times a day. If holy places are bathed in glory because of all the prayer that has been offered in them, then that must be true of these words, in which so much love, passion and hope has been placed. Has anything beautiful or generous come out of Christianity in response to the tragedy of 9/11? On the micro level, I’m sure there must be Christians and communities which have responded in positive ways, but the big picture looks overwhelmingly gloomy on this ninth anniversary of the atrocity. Pastor Terry Jones of Gainesville, Florida, and his threatened Qur’an-burning stunt is a powerful example of how easily the Christian faith can turn ugly, profoundly betraying the open-hearted teaching of Jesus. Although Terry Jones has now abandoned his Qur’anic bonfire, he seems to think his notoriety can be traded in for religious influence, as he’s been demanding that the Islamic centre proposed near Ground Zero be dropped. Unsurprisingly, his voice is being ignored. One creative response to the threat of Qur’an-burning has been made by Revd Larry Reimer, minister of the United Church of Gainesville. ‘If they can burn it, then we can read it,’ he says in a blogged interview. Along with other local church leaders, he’s going to be reading passages of the Qur’an at church services tomorrow, 12 September. I’ve never read the Qur’an or had much desire to, but the whiff of unholy bonfire smoke has finally given me the curiosity and impetus to see what is inside its covers. If fellow believers with so few functioning brain cells as Pastor Jones want so much to destroy it, that’s a strong argument for discovering the Qur’an for myself. The desire to burn comes from fear and rage, but fear and rage were never part of the gospel I received. So I’m going to sit down with the Qur’an and read and reflect on what it has to say, and post occasional comments here as I go along. I’m a Christian, so I can’t help coming to it with Christian-flavoured preconceptions. I’m also a complete newbie to the Islamic scriptures, but I see that as an advantage, as my impressions will be fresh ones. I’m setting out to read appreciatively, respectfully and critically – just as I read the scriptures of my own faith. The edition I’ve bought is the 2008 translation by Tarif Khalidi, published by Penguin… just in case anyone wants to read along with me.